Sabrina: Did they burn real witches at the stake? Salem: No, of course not, whoever told you that was a liar and a fraud. Usually, they were drowned in a river, or hung. Sabrina: Thanks, I feel a lot better. 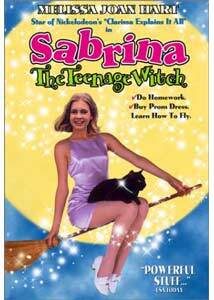 Fans of the family-friendly television comedy, Sabrina the Teenage Witch, who didn't have access to cable in the mid-1990s may be pleasantly surprised to discover that an identically named movie served as inspiration for the series. One of Showtime's highest rated originals for the younger set and based on the Archie comics favorite, Sabrina Sawyer (Melissa Joan Hart) is an incredibly gifted teen just shy of sixteen who possesses magical powers beyond her understanding—only she doesn't know it yet. With Sabrina's parents away on a "sabbatical," its up to quirky aunties Hilda and Zelda (Sherry Miller, Charlene Fernetz) to keep mum on a secret they cannot reveal to her: Sabrina, like her aunts, is a witch. But subtle hints keep popping up in front of the soon-to-be spell caster that culminate in a sneak peek at an odd-looking tome that Zelda fails to hide very well. It's a book of spells, but Sabrina doesn't realize this, either, thanks to the clever "no peeking" design of the content. Sabrina has a vivid dream filled with visions of her aunts welcoming her into the fold. Awakening the next morning to tell her kin all about it, house cat Salem suddenly joins the conversation. After the initial "Whoa!" moment, she becomes like a kid in a candy store with her newfound powers: overpriced clothes become affordable, javelin throwing during track practice is a piece of cake, and when school meanie Katy Lemore (Lalainia Lindbjerg) gets on her nerves? No problem. Best of all, she'll be able to make resident hunk Seth (Ryan Reynolds) succumb to her charms. Only one catch, though—romantic inducement is a no-no in witch's code, according to Aunt Hilda ("Love is too precious to tamper with," she surmises). Salem is living proof of the punishment for friskiness in the first degree: Life as a black cat for the next nine decades. But thanks to Sabrina's newfound popularity and athletic abilities, she's not having to lift a finger much less a wand to entice him, much to the chagrin of Katy, who also wants the cocky jock all to herself. Despite a bigger budget and shinier locales, this feature-length Sabrina debut lacks the tightness of its eventual television counterpart; basically, a half-hour pilot that struggles to pad 90 minutes. Also interesting is the tone of many front line characters in this version that contrast sharply to their small screen versions. One such example is the portrayal of Hilda and Zelda in a low key, almost playing-it-straight approach. Although Fernetz and Miller are competent, they don't hold a candle to the broader, more effective comic chemistry Beth Broderick and Caroline Rhea brought to the regular series. But no tweaking was necessary for the actress portraying the series' namesake, Melissa Joan Hart. Making a successful transition from her pre-teen triumph in the Nickelodeon sleeper. Clarissa Explains It All For You, she infuses Sabrina with the same instant likeability that made that show so enjoyable. Given the irresistible mix of girl-next-door charm and mischievous fun, it's no surprise that Hart cast quite a spell upon her target demographic, resulting in a very successful seven season run. Image Transfer Review: Bright, colorful and sharp, it's one of the better made-for-television movie transfers from Artisan in quite a while. It also marks the first such mastering I've seen from 342 Media DVD Center. Only a tad too much grain during a nighttime scene prior to the Sadie Hawkins dance in the final third, and a couple of very minor artifacts were the only noticeable really flaws worth noting, but in comparison to much of Artisan's previous eyesores, this is a major step in the right direction as far as quality. Audio Transfer Review: At the risk of sounding like a crotchety old uncle who hits the hay while the sun's still going down, the low end on this track is just a little too LOUD, but it's only a detriment during a third of the musical selections, so not that big a whine. Other than that, a very spacious Dolby Stereo mix balances music and dialogue very well. Extras Review: In the vein of many Artisan back catalog budget title, no bonuses are included. But if I had my own magic wand, I would have conjured up a Hart to Hart commentary track (with combination mother/co-executive producer Paula). Slightly long winded and a touch bloated, Sabrina the Teenage Witch still has its share of smile-inducing moments, good laughs and a fun performance from Melissa Joan Hart. An above average transfer from Artisan makes this an easy recommendation for fans of the companion series.